Ivan Ziatyk was born on 26 December 1899 in the village of Odrekhova, some 20 kilometers south-west of the town of Sanok (now a territory of Poland). His parents, Stefan and Maria, were poor peasants. When Ivan was 14, his father died. The burden of bringing up the child was taken up by his mother and elder brother Mykhailo, who took the place of his father for Ivan. In his childhood, Ivan was very quiet and obedient. Already when studying in the village primary school, he displayed his capabilities as a gifted student. It was also possible to to notice the boy's profound piety. Ivan received his secondary education in the Sanok gymnasium, where he studied from 1911-1919. During his studies in the gymnasium, Ivan's academic performance was very good and his behaviour excellent. In 1919 Ivan Ziatyk entered the Ukrainian Catholic Seminary in Przemysl, and he graduated with distinction on 30 June 1923. That same year, after having completed his theological studies, Ivan Ziatyk was ordained a priest. From 1925-1935 Fr. Ziatyk worked as a prefect of the Ukrainian Catholic Seminary in Przhemysl. In addition to the spiritual direction of the seminarians, he also contributed to their intellectual formation: He taught Catechetics and Dogmatic Theology at the same Seminary. In addition to his work at the Seminary, Fr. Ivan Ziatyk also performed the duties of spiritual director and catechetics teacher at the Ukrainian Girls' Gymnasium in Przemysl. Fr. Ivan Ziatyk was a person of great kindness, obedience, and spiritual depth. He always made a deep impression on those around him. Fr. Ziatyk for quite a long time had had a desire to join a monastery. Although this intention was not welcomed by his Church superiors, on 15 July 1935 Fr. Ivan Ziatyk made the final decision to join the Redemptorist Congregation. Soon thereafter, the Redemptorist Provincial Fr. Joseph De Vocht was deported to Belgium. Before his departure, he transferred his duties of Provincial of the Lviv Province and of Vicar General of the Ukrainian Greek-Catholic Church to Fr. Ivan Ziatyk. This caused the police to pay special attention to Fr. Ziatyk. On 5 January 1950 a decision was made to arrest him, and on 20 January the warrant was issued. After numerous interrogations, on 4 February 1950 Fr. Ivan Ziatyk was accused: "Ivan Ziatyk indeed has been a member of the Redemptorist order since 1936; he promotes the ideas of the Roman Pope of spreading the Catholic Faith among the nations of the whole world and of making all Catholics". The investigation of Fr. Ziatyk's case lasted for two years. Fr. Ziatyk spent the entire period in the Lviv and Zolochiv prisons. During the period from 4 July 1950 to 16 August 1951 alone, he was interrogated 38 times, while the total number of interrogations he underwent was 72. Despite the cruel tortures that accompanied interrogations, Fr. Ziatyk did not betray his faith and did not submit to the atheist regime, although his close relatives were accustomed to persuade him to do so. The verdict was announced to Fr. Ziatyk in Kiev on 21 November 1951. He was sentenced to 10 years imprisonment for "cooperating with anti-Soviet nationalistic organization and anti-Soviet propaganda". The term was to be served in the Ozernyi Lager prison camp near the town of Bratsk in Irkutsk region. During his imprisonment, Fr. Ziatyk suffered terrible tortures. According to witnesses, on Good Friday 1952 Fr. Ivan Ziatyk was heavily beaten with sticks, soaked in water, and left unconscious outside, in the Siberian frost. Beating and cold caused his death in a prison hospital three days later, on 17 May 1952. Fr. Ziatyk was buried in the Taishet district of Irkutsk region. The Great Architect laid another precious tile into the great mosaic of martyrdom. Taking into account the testimonies of Fr. Ivan Ziatyk's virtuous life, and particularly his endurance, courage and faithfulness to the Christ's Church during the period of persecution, the beatification process was started on the occasion of the Jubilee Year. On 2 March 2001 the process was completed on the level of eparchy, and the case was handed over to the Apostolic See. On 6 April 2001 the theological committee recognized the fact of Fr. Ziatyk's martyrdom, on 23 April his martyrdom was verified by the Assembly of Cardinals, and on 24 April 2001 Most Holy Father John Paul II signed a decree of beatification of Fr. 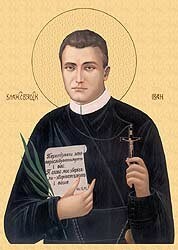 Ivan Ziatyk, a blessed martyr of Christian faith.